Dimuth Karunaratne was on 46 when he was hit by a Pat Cummins bouncer. Sri Lanka batsman Dimuth Karunaratne is in “good spirits” in hospital after being taken away from the second day of the Test against Australia in an ambulance. 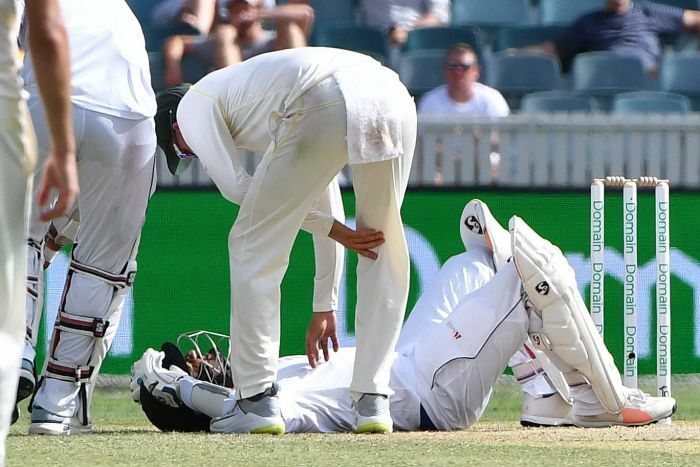 Karunaratne was felled by a Pat Cummins bouncer that hit him in the neck in the 31st over of Sri Lanka’s first innings at Manuka Oval. As he stumbled back, dropped his bat and collapsed, it was impossible for Australian audiences not to be reminded of the similar scenes at the Sydney Cricket Ground in November, 2014 when Phillip Hughes was hit in the neck, collapsed on the field and never recovered. “It’s never nice. You never like seeing that,” Kurtis Patterson, who notched his maiden century earlier in the day, told the media after play on day two. “You want your fast bowlers to be aggressive and set them up to get the nick, but you never like it when players go down like that. “I’m hoping he’s OK, hoping he can come out and bat again tomorrow. Somewhat surprisingly, no eerie silence fell across the ground immediately. In fact, the last part of the stands to go quiet seemed to be the Sri Lankan supporters — one of whom was banging their drum while Karunaratne was seen to by medics. Eventually the opener was placed on a stretcher on the pitch and lifted onto the medicab, before being raced off the field and into a waiting ACT Ambulance behind the Sir Donald Bradman Stand. Karunaratne was taken to the nearby Canberra Hospital, with his father and sister reportedly close behind. 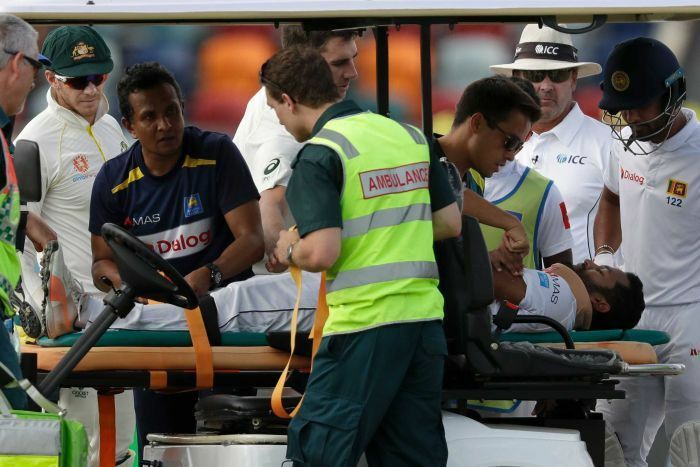 ACT Ambulance Service said he was taken to hospital as a precautionary measure and Sri Lanka coach Chandika Hathurusingha reassured everyone that the opener was doing OK.
“He’s being assessed [and is in] no danger at the moment,” Hathurusingha said after play. “He was talking to us before he [left the ground]. “It was a bit scary at the start, the way he fell back, but he was OK.
“He was talking to the umpires and the physio throughout. Karunaratne, who was on 46 and looked certain to become the second Sri Lankan to make a half-century in the series, has been a dominant force at the top of the order for Sri Lanka in recent months. Since July of last year, he has scored one century and seven half-centuries at the top of the order for an average of 52, well above his career average in the 30s. Karunaratne’s scary injury was one of a number of instances of Sri Lankan batsmen struggling with short balls from the Aussie bowlers. It followed opening partner Lahiru Thirimanne getting rapped on the hand by a short ball from Jhye Richardson and requiring treatment, and preceded the dismissal of captain Dinesh Chandimal, who awkwardly gloved a Mitchell Starc bouncer that was flying over his head. “We lost a couple of wickets so definitely it was a bit of a distraction,” Hathurusingha said. Sri Lanka was 0-82 when Karunaratne was forced off the field and ended the day 3-123, trailing by 411 with no idea if their opener can resume his innings on day three.